Nothing ruins a day of fun on Lake Metigoshe in the Turtle Mountains, or on Lake Ashtabula, like a serious jet ski accident. During the busy summer season, accidents commonly occur on the popular waterways of North Dakota. Boaters, skiers and watercraft often use crowded waterways at the same time, creating a high risk of accidents and injuries. According to the United States Coast Guard, personal watercraft, such as jet skis, are among the water vessel types most commonly involved in boating-related accidents. At Larson Law Firm P.C., our seasoned North Dakota jet ski accident attorneys understand the severe toll that a jet ski injury can have on your life. You can be left with debilitating physical and emotional pain, requiring years of expensive treatment and rehabilitation. Our legal team has a proven track record of successfully resolving all types of accident cases, including boating and jet ski accidents. We diligently fight on your behalf to get you the monetary compensation that you deserve. In any personal injury case, negligence must be proven. Negligence is the failure to use reasonable care, resulting in damage or injury to another person. Determining negligence in a jet ski accident can be complex and confusing. There are many factors to consider, including operator and manufacturer liabilities. If the rental company did not provide safe, properly functioning jet skis, they can also be held liable for the accident. 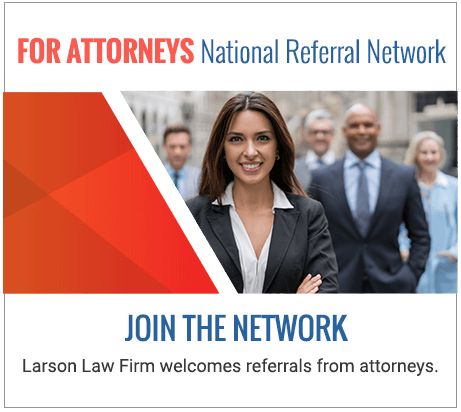 At Larson Law Firm, our team of experienced attorneys have the knowledge and resources to thoroughly investigate the cause of your accident and identify all responsible parties. We know that a serious jet ski injury can drastically alter your quality of life. You may be unable to perform daily physical tasks or return to work, resulting in a loss of income. That is why we pride ourselves on being the personal injury law firm you can trust for the legal guidance you need. If you or a loved one suffered a jet ski or boating injury, while operating a recreational vehicle, or because of another party’s negligence, reckless behavior or carelessness, our skilled attorneys evaluate the details of your case and provide you with honest advice on how to proceed. Rely on the skilled legal team of Larson Law Firm P.C. to handle your jet ski injury claim. We are not a law firm that quickly jumps at the first settlement offer. Instead, we diligently work to get you the best possible outcome in the shortest possible time. Our office is located in Minot with easy, accessible parking. We also serve the residents of Ward, Williams, McKenzie, Pierce and Mountrail Counties with their personal injury needs. If you are unable to drive to our office, one of our dedicated attorneys will make a personal hospital or home visit to speak with you. For more information or to schedule a free initial consultation, complete our contact form or call us at 701-484-HURT.